For those that deny the existence of the Military Industrial Complex (MIC) described by Dwight D. Eisenhower as he left the oval office I think I can prove empirically that the SPADE Index demonstrates the naivete of such a view (See Figure). Between the end of 1997 and September 10th 2001 the SPADE rose by 107%, but between 9-11 and 9-14-2009 it more than doubled (205%). Overall the SPADE has grown by 233% since it’s origination in December of 1997. So whats so important about these data? Well looking at the Dow Jones Industrial Average (DJIA), S & P 500, and NASDAQ we see that they grew by 103%, 99%, and 90% respectively between December of 1997 and 9-11. These trends are well alligned with what I described for the SPADE during the same time period. Heres the rub these indices only grew by 111%, 103%, and 142%. It is understandable that the NASDAQ would outpace the DJIA and S & P 500 as it was operating from a lower base. We are seeing that this country is relying more on the financial services and war profiteering industry 2 nefarious and wealth concentrating sectors of our economy. I must wonder where the outrage is? We have been conditioned to believe that all of us can have a big piece of the pie when infact the folks that pull the strings of these industries would in no way allow such an event to occur. It would be called wealth redistribution and we know what the neoconservatives and evangelical right-wingers think about such a prospect. The SPADE provides concrete evidence that we are moving towards a society that embraces Frederick the Great’s belief that “Diplomacy without war, is like music without instruments.” For those that think that Bush, Cheney, Rumsfield, et al’s fingerprints have been removed from the dialectic I call your attention to the Supreme Court and the SPADE’s trajectory. The day the signal died! It was June 5th, 1997 a day that at first glance seemed quite innocuous. 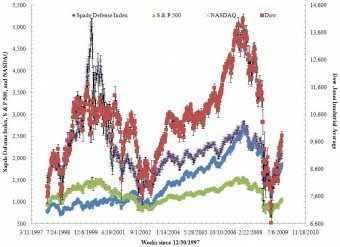 However, there was nothing insignificant about this day from a financial services perspective as it was the day that the Dow Jones & Company signed license agreements for three exchanges to begin trading in the nascent futures market (http://www.nytimes.com/1997/06/06/business/after-15-years-dow-jones-lets-futures-trade-on-its-average.html?scp=2&sq=Norris%201997%20futures&st=cse). Initially Dow Jones was hesitant for fear of excessive market manipulation, but later determined regulations were sufficient to allay such fears. According to an article at the time by Floyd Norris in The Times an editor at the Wall Street Journal John Prestbo felt “…that trading in the Dow derivatives would have little if any effect on market volatility.” Well this appears not to be the case at all. 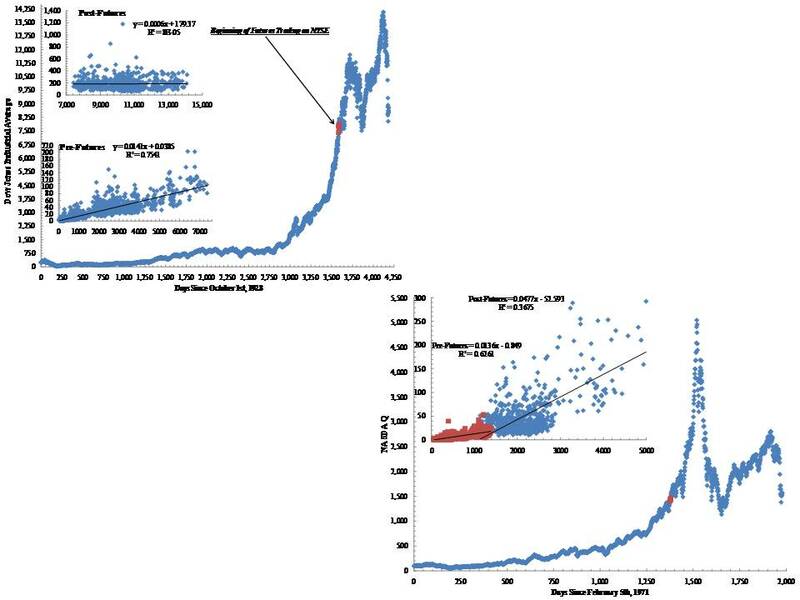 In looking at the historical record for the Dow Jones and NASDAQ I came across a very curious divergence that was initiated on or around June of 1997. It turns out that prior to that month and year what the Dow opened at was a fairly (R2 = 76%) robust linear predictor of their volatility throughout the day, previous day, and next day. However, post-June 1997 this relationship was non-existent. 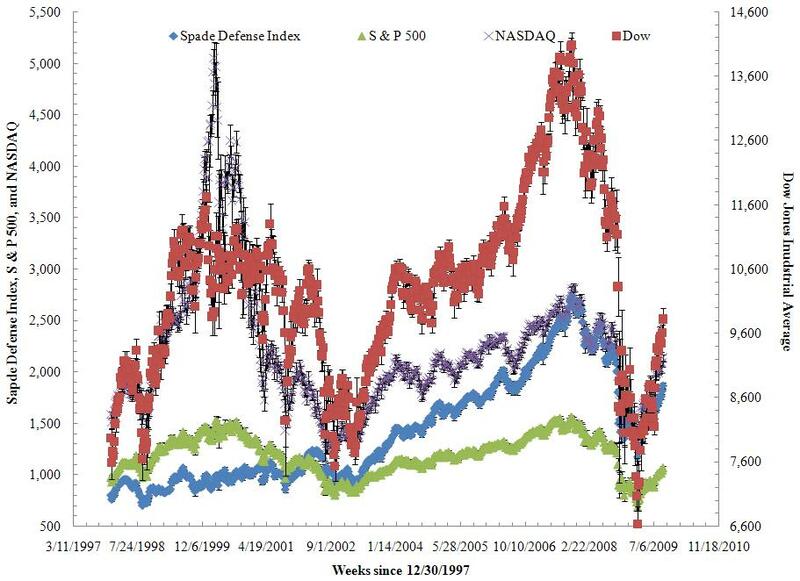 The same is evident for the NASDAQ, however, the change in predictability declines by 26% vs the 76% for the Dow. This is fascinating to me and I think it speaks to what we in the biological community refer to as “Buffer Capacity” or “Poise”. That is to say how well a system in this case the Dow & NASDAQ are equipped to handle a perturbations or in the ecological world invasive species. 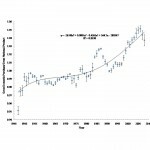 Regardless the point is that all those who were sure that futures were good for business writ large appear to be wrong and furthermore their contentions as to the level of volatility associated with futures are greatly underestimated, given that the data presented here demonstrate even short-term/daily swings in the market have become increasingly difficult to forecast post-futures. 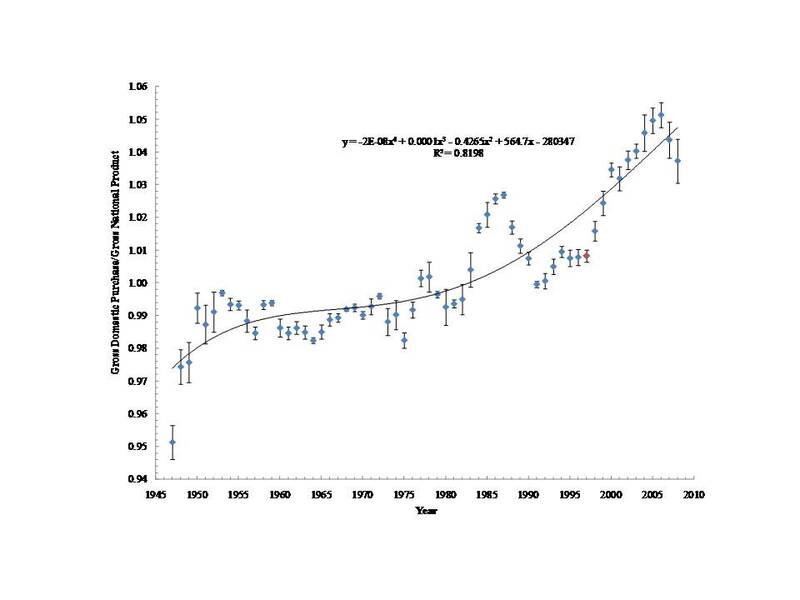 This happened to coincide with a considerable uptick in the ratio of Gross Domestic Purchases (BDPu) to Gross National Product (GNP), more than double the increase from 1980-1987. 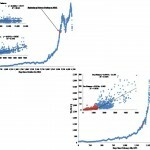 It is becoming clear from this data that two things are happening at an accelerated rate in the markets: 1) volatility and risk are increasing at an unsustainable exponential rate and 2) the corporate world and financial “institutions” are working very hard to constrain the popular rhetoric so as to promote consumer spending at an equally unsustainable level. Why? Because the multi-nationals, banks, and insurers are assuming – and rightfully so to this point – that the former orgasmic spending will counterbalance the latter’s total disregard for future generations or their fiduciary responsibilities down the road. This is the message our in-the-pocket of the banking industry Treasury Secretary and National Economic Adviser Timothy Geithner and Lawrence Summers will not tell us. The more this volatility increases the more the American citizen will pay for it, whether it be lessening mark to market accounting regulations, non-recourse loans for the folks engaging in the PPIP, or outright fraud in the case of AIG and the cozy relationship Geithner’s predecessor Henry Paulson had with virtually everyone on Wall Street. Consider that Bush told us to go out and spend after 9-11 and now this administration and congress are telling us that we should spend. Is spending the solution to everything? The solution is understanding that capitalism has tons of problems and one is the boom-bust nature of it all. Well in nature there are those systems that require fire to regenerate and if they don’t get it at timely intervals productivity stagnates. Furthermore, in these systems there are 2 types of fire regimes with one being frequent, mild, and spatially confined to small areas, while the other is an infrequent, spatially broad, and intense scouring of the land. We need the latter desperately, but what we don’t need is a bunch of tricky financial instruments and an over reliance on consumer spending to get us out of this. These amounts to using the frequent mild fire to resuscitate an ecosystem in desperate need of a complete overhaul. The fat cats on Wall Street might need this for their substantial egos and bank accounts, but it is time we decouple from this Oligarchic way of running things as Simon Johnson stated recently in The Atlantic. They can afford & indeed thrive on the amazing daily volatility of the markets, because they always get their share of the pie, but we can’t because we didn’t, don’t, and won’t if this aggregation of wealth continues based entirely on our insatiable appetite for stuff!